Pardon the vulgarity of the following statement but it seems appropriate: If Godflesh and In Slaughter Natives fucked their offspring might be Tristan Shone, aka Author & Punisher. I had the wonderful opportunity to see Mr. Shone perform in Los Angeles last Sunday night at intimate venue The Echoplex. His performance was transcendent – something more than a concert it was an audio/visual experience that interfaced with my nervous system and short-circuited my ideas of what music is and can do. I had pretty much expected no less. Despite those expectations and as impressed as I have been over the last year with Author & Punisher as a recorded entity nothing prepared me for experiencing him live, not even the plethora of performance footage that can be found on youtube. The youtube clips give you an idea of what you are in for functionally when you see A&P live; it lays out the idea that Shone is a one-man show, that he doesn’t so much interact with the audience as he interacts with his machines which then interact with the audience. That might not sound massively revolutionary but actually I think that it most certainly is. 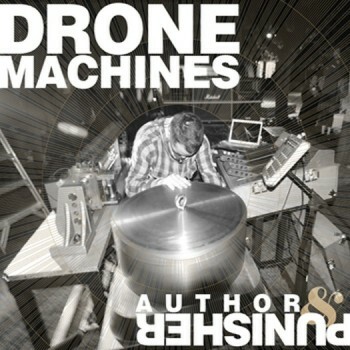 A DJ is a similar experience on a very basic level, however a DJ interacts with his machines in a more instrumental level – well, the best ones do anyway – but what Tristan Shone does is strap himself into a machine that then acts as a physical as well as instrumental extension of his body. It reminds me very much of science fiction, specifically China Mieville’s Remade; people bonded with machines or alien flesh as punishment for crimes they have committed. Tristan Shone has committed no crime, except to maybe kickstart what I believe is going to be an increasingly refined musical movement that will be played in the not so distant future by grinders and Body Mod aficionados; people who become their instruments. This is something I’ve been expecting for some time and have come to think of – in terms of a genre quantifier for discussions sake – as either “Biohack” or “GryndCore”. We’re not quite there yet, but mark my words, Author & Punisher is the conduit through which we pass to get there. What Tristan Shone does is not a traditional musical experience. What you are really watching when you watch this man evoke these electronic, apocalyptic dirges he creates is a performer I would refer to as a ‘sonic sculptor’. Utilizing custom-fabricated machinery that staggers my ability to properly explain here, Shone fires and hones raw frequencies, sounds and percussive elements into completely new and sensory-overwhelming tones that take on a very physical presence in the space within which they are made. Where solo acts often become dwarfed playing on a larger stage Shone’s machine is a centerpiece out from which his presence emanates and grows until it occupies every perceivably molecule of the local aural spectrum, as well as those of the visual. The former is all Shone, the latter is accomplished not only through the sheer agonizing joy of watching this man operate his machines, but also through a complex series of visual accompaniment pieces created by audio/visual artist CutMod and projected behind/around/atop Shone as he plays. You can read CutMod’s essay on how he created and integrates these visuals into the performance here, but for our purposes I’ll just say that it includes filmed footage as well as three distinct camera feeds that ‘project’ Shone and his machine back on itself, effectively creating an eerie, exponential double/triple image that further helps him extend his presence over the entire stage and show you bits and pieces up close of just how he is creating this music. The tone of the music you hear on an Author & Punisher record is engulfing to say the least, but to hear it live, in a big room is something else entirely. Speakers can only transduce/re-create sounds within their specified limitations. Now, granted most speakers have a pretty good frequency response range; the goal has always been to mimic the FRR of the human ear, and most come close. Couple to this the fact that there’s not a lot of music out there doing things outside that Frequency range and normally, beyond the performance aspect of any given concert you attend and the slight variance/improvisation the musicians may apply within what you get is what you have experienced, for the most part, on the record. This is not the case with Author & Punisher, as the tones Shone manipulates take on harmonic and exponential relationships with the room within which he operates. This is true to some degree of regular music as well, but with Author & Punisher the sounds become swelling, juggernaut-like holograms of themselves due to the ‘sculpting’ aspect of what this man is doing and how he is doing it. When Shone began his set last Sunday it very much felt like a living entity that existed in a sphere of reality I could not so much see as sense assembled itself onstage, stood up and moved out into the room. It is a sound that is both oppressive and strangely uplifting, the same way very good post apocalyptic fiction makes you contemplate both the loss of the characters but also their continued survival. Shone’s music survives by pummeling with an experience that – both visually and sonically – you’ve most likely not had previously. Therein lies the transcendent nature of his live set and the best possible reason I can tell you if you get the chance to see him, TAKE IT. Author & Punisher is music for the end of the world at a time when the world is obsessed with it’s own demise and because of that I think this man will grow in both size and audience, ushering in what may be the first ‘new’ approach to music in generations.